With home prices steadily increasing, more and more buyers are choosing tiny homes to make their homeownership dreams a reality. At only a few hundred square feet, these small, compact-sized properties offer buyers an affordable, streamlined way to get out of the rent race—without all the bidding wars, contingencies and high costs that come with a traditional real estate purchase. 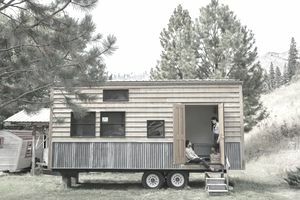 In most cases, tiny houses range anywhere from $10,000 to $100,000, depending on who’s doing the building, how large the house is and the amenities and features you add on. While these prices pale in comparison to most single-family homes, many buyers still need financing to see their homeownership goals achieved. Mortgage loan - If the tiny home complies with local building codes, is affixed to a permanent foundation and costs more than $50,000, you might be able to use a traditional mortgage lender for your financing. Most lenders have a minimum loan amount of at least $50K. RV loan - Recreational vehicle loans can be a good fit if your tiny home is on wheels. You’ll just need to make sure the house is eligible for certification by the Recreation Vehicle Industry Association. If it is, most banks and credit unions can offer you RV financing. Personal loan - Personal loans are also a common choice when financing a tiny home. These generally come with a higher rate than RV and mortgage loans, though, so make sure you explore all your options before choosing a personal loan. Personal loans should be your last resort when financing a tiny house. In the event you’re building or buying your tiny house as a second home or vacation property, you can consider using a home equity loan or home equity line of credit (HELOC) to finance the project. This allows you to borrow against the equity in your primary residence if you have any. RV Loans vs. Personal Loans: Which is Best? Because a large majority of tiny homes come in under $50,000, most buyers tend to use an RV loan or a personal loan to finance their property. The big difference between these two options is the interest rate they come with. RV loans are similar to mortgage loans in that they use the property as collateral. If you don’t make your payments, the lender can foreclose on the home, sell it and make their money back. That means the loan is overall less risky for a lender. Personal loans are a different story. Because these loans are unsecured — meaning there’s no piece of property to safeguard the lender if you fall behind — there’s a lot more risk involved. As a result, lenders charge a higher interest rate on personal loans than RV ones. This means a higher monthly payment and more interest paid over the life of the loan. Due to the more favorable terms, you will want to use an RV loan if at all possible. If your tiny house is ineligible for RVIA certification, however, a personal loan may be your only choice. Aside from the up-front costs to purchase or build your tiny house, there are also monthly expenses to consider before diving in. As with a traditional home, you’ll have costs for water, utilities and any other services you use in the home — though these with often be much lower than those on a larger, single-family house. You’ll also need to factor in insurance costs (either home or RV insurance, depending on the type of tiny house you purchase). Your location will also impact your costs as a tiny house owner. Will you buy or lease land? If you buy, you’ll need to take land costs, property taxes and more into account. If you lease, you’ll have your rent, water hook-ups, trash service, community dues and other expenses to consider. If your tiny house is on wheels, there are costs there, too. You’ll need to cover gas, regular maintenance and repairs, licensing, registration and, potentially, renting RV spots. If you’ll be on the road a lot, you might also consider a bigger cell phone data plan or onboard Wi-Fi services to make communicating, working or just accessing the web easier while you’re on the go. Is That Home for Sale a Legit Online Listing?